At IdeelArt, you’ll find work by some of the greatest abstract artists in the world. Bob Thompson died of a heroine overdose at age 28, but he completed nearly 1000 paintings and drawings in his brief career. The Whitney Museum of American Art celebrated his work in a 1996 retrospective, and this spring his paintings, and words, will anchor a major Whitney exhibition on color. I have something inside of me that is just bursting, twisting, sticking, spilling over to get out. Out into souls and mouths and eyes that have never seen before. The poetry and passion in those words come through brilliantly in his paintings, many of which appropriate the compositions of the Old Masters, abstracting the figures and landscapes to create expressionistic, jazz-inspired worlds defined by vivid and illusory color palettes. Thompson perfectly represents this exhibition, since the curation ignores traditional designations related to movements and styles. Thompson was never beholden to any one movement or method – he pulled from Pop Art, Fauvism, Expressionism, Figuration, Abstraction, and anything else that served his vision. Likewise, Spilling Over: Painting Color in the 1960s will spotlight myriad aesthetic positions, including Op Art, Hard Edge Abstraction, Color Field Painting, Post Painterly Abstraction, Abstract Expressionism, Minimalism, Feminist Art, the Pattern and Decoration Movement, and early Modernist Geometric Abstraction. 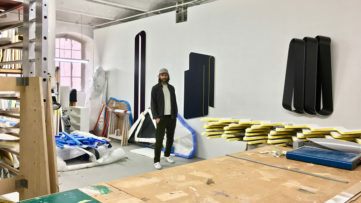 And it will include works from an equally broad and diverse assortment of artists, some famous, such as Josef Albers, Helen Frankenthaler, Sam Gilliam, Ellsworth Kelly, Morris Louis, Kenneth Noland, and Frank Stella, and some less well-known, such as Kay Walkingstick, Emma Amos, Richard Anuszkiewicz, Frank Bowling, Marcia Hafif, Al Held, Alvin Loving, and Miriam Schapiro. Drawn entirely from the existing Whitney collection, it will offer a comprehensive glimpse at the true diversity of artistic expression that existed during one of the most fertile eras in the history of 20th Century art. In preparation, here are brief profiles of six of the lesser known artists featured in the exhibition. When Emma Amos first arrived in New York City in the early 1960s, she encountered resistance from colleges, who told her she was too young to teach, and from gallerists, who would not show her work either because she was black or female. Her refuge was found in the company of other artists, who expanded her already lengthy art education by sharing with Amos the lessons of their craft. She learned about textiles from Dorothy Liebes; about printmaking from Letterio Calapai; and about the nuances of addressing social issues and politics in her work by members of the Spiral Group, of which Amos was the only female member. Amos has long distinguished herself with her radical imagination, and the courage she had shown to embrace multiple different styles, techniques, and historical references. She is one of the great living pioneers of Post Modernism. 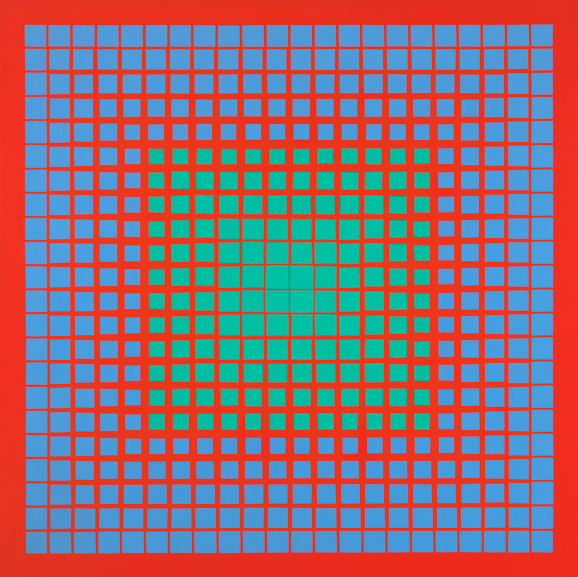 Along with Bridget Riley, Richard Anuszkiewicz is one of the last living pioneers of the Op Art Movement. As a young artist, Anuszkiewicz noted that color was the one thing eluding his grasp, so he went off to Yale to study color theory from the great Josef Albers. The unique visual voice Anuszkiewicz developed made his work groundbreaking for its time. Many people touted its brilliance, but only one painting sold from his debut solo exhibition. Happily for Anuszkiewicz, that one buyer was Alfred F. Barr, Jr., Director of the Museum of Modern Art. That single, powerful fan brought Anuszkiewicz to the attention of Whitney curators, who promptly included him in a major group exhibition on Geometric Abstraction, and insured his inclusion in The Responsive Eye, the exhibition that put Op Art on the map. 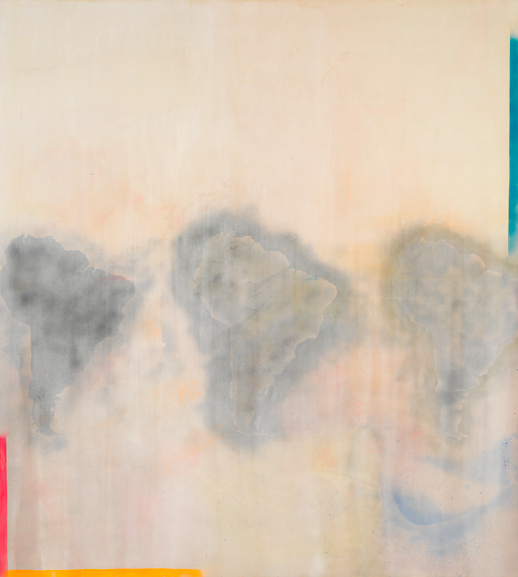 At age 85, Frank Bowling is finally receiving the global notoriety he has deserved for decades. His luminous canvases radiate with color and atmosphere. Seamlessly incorporating a multitudinous variety of methods, they bridge diverse aesthetic positions like Pop Art, Color Field Painting, Abstract Expressionism, Arte Povera, and Post Painterly Abstraction. Later this year, Bowling will be spotlighted in a monumental retrospective exhibition at Tate Britain, which will span 60 years of his career. Among the most recent acquisitions included in this exhibition will be works by Kay Walkingstick, a Native American artist whose work creates transcendent bridges between the indigenous aesthetic traditions of her Cherokee roots and the aesthetics of global Post Modernism. Walkingstick is a predecessor of, and influence to, younger indigenous artists like Jeffrey Gibson who strive to explore the ramifications of the universalities shared by ancient and modern artistic traditions. Alvin Loving created a visually stunning body of work that, among other things, defined color as the primary unifying factor between Abstract Expressionism and Hard Edge Geometric Abstraction. His energetic, gestural paintings and material-focused, multi-media collages are emotive and lyrical. 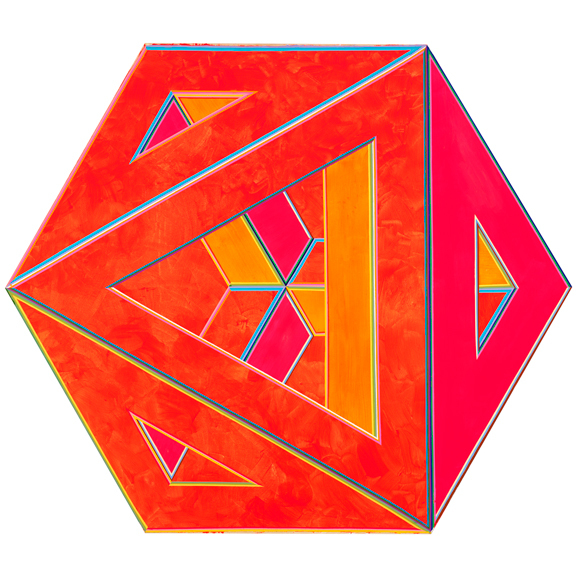 His geometric abstract works, meanwhile, are calculating and bold, and easily among the most eye-catching and intellectually stimulating works of his generation. 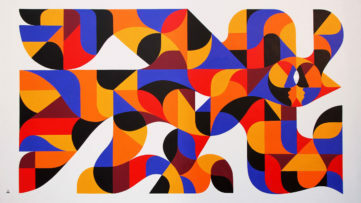 A contemporary of artists like Sol Le Witt and Victor Vasarely, Loving took their ideas and scholarship to another level, infusing his work with visual energy that makes it feel fresh and alive even today, nearly a generation after his death. Feminist Art icon Miriam Schapiro participated in the groundbreaking installation Womanhouse, and became one of the most influential voices within the Pattern and Decoration Movement. Schapiro confronted gender biases in the art world by deploying materials and techniques associated with domesticity and craft. The undeniable mastery, beauty, and intellectual integrity of her work exposed the absurd patriarchal prejudices that had always dominated the art world. 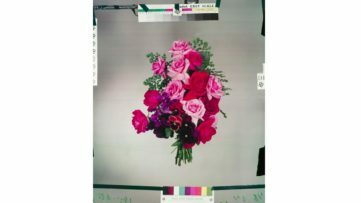 Color was a quintessential element of her oeuvre, charging her works with an electric, almost vibratory sense of action, and calling attention to the ability of formal aesthetic elements to become activated as tools for social and political change. 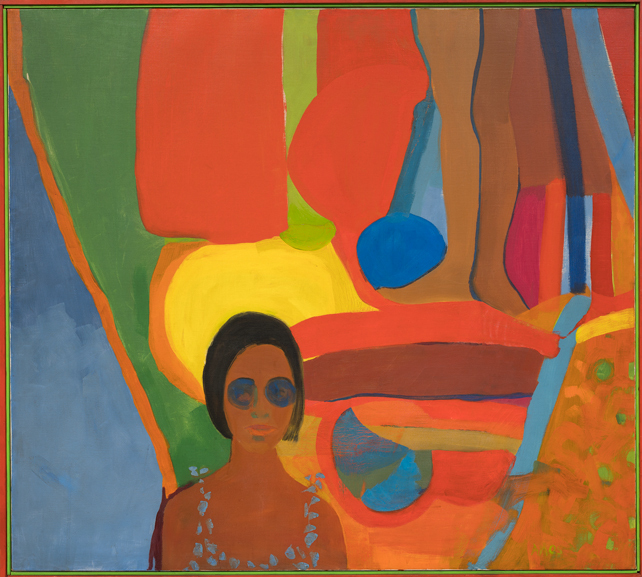 The exhibition Spilling Over: Painting Color in the 1960s will be on view at The Whitney in New York until August 2019. 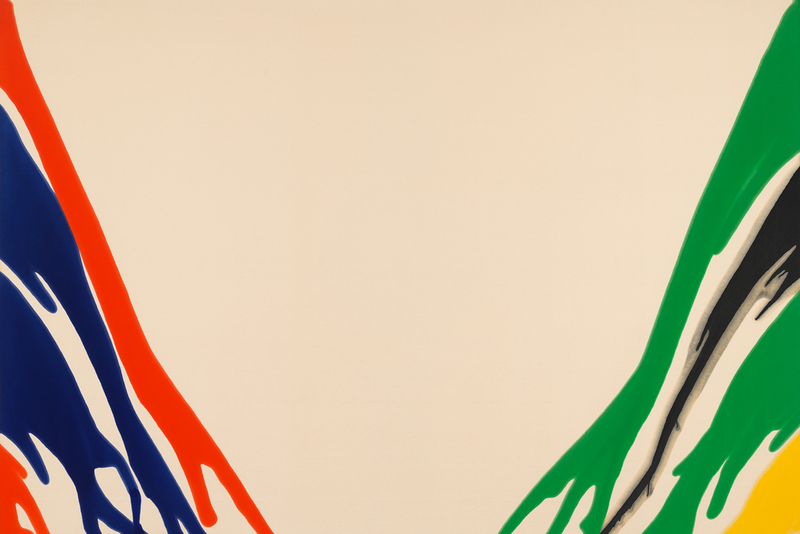 Featured image: Morris Louis – Gamma Delta, 1959-60. Magna on canvas, 103 1/8 × 152 1/2 in. (261.9 × 387.4 cm). Whitney Museum of American Art, New York; purchase with funds from the Glen Alden Foundation and the McCrory Foundation, Inc. 69.57. © 2018 Maryland Institute College of Art (MICA) / Artists Rights Society (ARS), New York. All images courtesy The Whitney Museum of American Art.